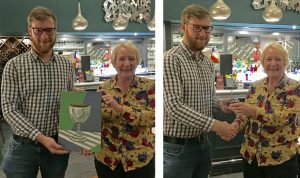 Chester Croquet Club marked the end of another successful season with a supper and trophy presentation at Chez Jules on Wednesday evening, 14 November. 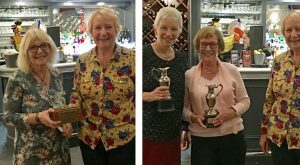 2018 saw Chester achieving a double victory in two North West Federation leagues, the Weekend Handicap League and the Level Play Golf Croquet League. Other successes during the year were winning the short lawn section of the Southport Croquet Festival in June and coming second in the full lawn handicap section. 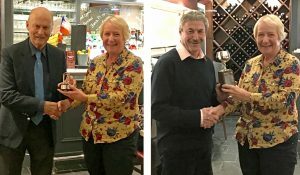 This year’s winners of the the club’s internal leagues and competitions were presented with their awards by club chairman, Sarah Andrew. 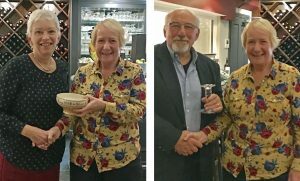 Left:: Jerry Guest receiving the Fletton Trophy for advanced croquet from Sarah Andrew having regained it from Mark Lloyd who won it from him in 2017. Right: Brian Walton receiving the Mason Cup for full lawn handicap association croquet. Left: Sally Slater receiving the Hasting Wang Short Lawn Bowl after winning it for the second year running. Right: Brian Hayes receiving the Peter Bingham Award for golf croquet. He was also awarded the club’s trophy for the most improved golf croquet player. The trophy for the most improved association croquet player was awarded to Barbara Jones who was unable to be present. Former club chairman, David Guyton, receiving a Croquet Association Diploma for services to croquet and a bottle of the club’s unique Sloping Lawn wine. 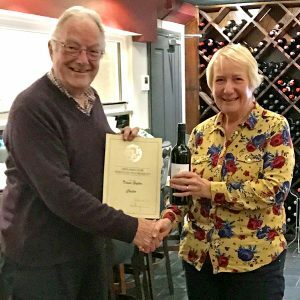 David was awarded the diploma at the recent Croquet Association AGM in recognition of his contribution over many years since joining the club in 2004. Many thanks to Sally and Chris Slater for the photographs.